Do you teach word families in your class? This week I am going to break down some of the activities we use. What I love most about word families is that it gives students confidence as they take that next step from knowing sounds to reading words. It helps with rhyming and I know if you can make it fun they will enjoy it so much more. Here is what we do to keep it fun! 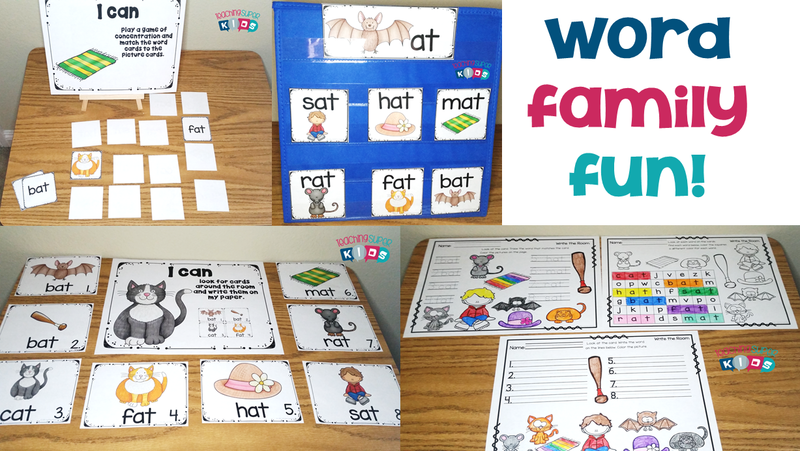 Write the room activities are so much fun and this set includes colorful word cards and 2 student response sheets. One set is differentiated for your students. One sheet is for those that are writing well and a tracing page for those that need extra practice. The other one is a search and find puzzle. I laminate the sound it out cards and student use dry erase markers to write the sounds in the boxes. Student response sheet included as well for this activity. My kidos LOVE to play a good ole fashioned game of concentration. Again, you can differentiate after you have introduced a few different word families to make the game more exciting. Use the picture cards from the concentration set to have the kids Say It, Make It and then write it out. The word cards can be used as a guide to see if they spelled it correctly. I love these cards as so many of my kidos need the extra practice writing. I laminate these cards and the student can pick them from a bag, read the word and trace it with an expo marker. The last thing my packs always include is EXTRAS! I believe that it is important to provide lots of opportunities for students to practice. You don’t have to print all of the pages out for each student pick and choose which ones you think will work best. There are some additional items included such as word wall cards, pocket chart cards as well as a poster with all of the words on one page. Would you like to try it in your class before you buy it? I would love to send you one complete packet of word family activities of your choice this week. All you need to do is fill out the form below and let me know which word family you would like sent your way and within 24 hours it will be in your inbox! Pick one word family set and I will email it to you free of charge. I can’t wait to try this with my students. Hi Susan, I just sent the sample on over please let me know if you have any questions on it! Thank you so much!